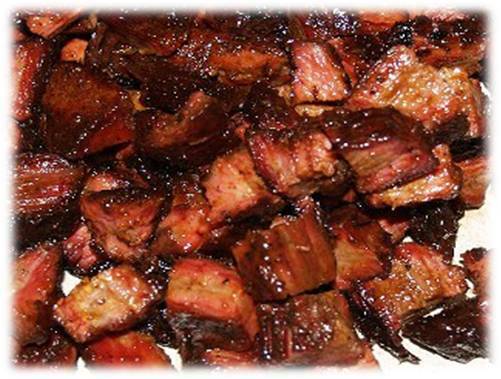 Made from the point of the beef brisket cut burnt ends are a specialty that originates from the Kansas City barbecue scene. Most people that have never had burnt ends think they are interchangeable with rib tips, but they are actually a juicy and tender morsel of the brisket cut into little squares. Burnt ends, as their name alludes to, are a cooked longer than traditional sliced brisket because the point contains a higher fat content than the flat of the brisket. This additional time allows the fat content to break down and tenderize the meat. Many restaurants don't go through the hassle of making burnt ends due to the time and delicate process used to smoke them. Unless you have access to a butcher that will sell you just the point of the brisket, you will need to understand how to cut the point off a full cut of brisket. Burnt ends are typically made by smoking the entire brisket, allowing the meat to rest and cool, then cutting off the point and cooking it longer by itself. 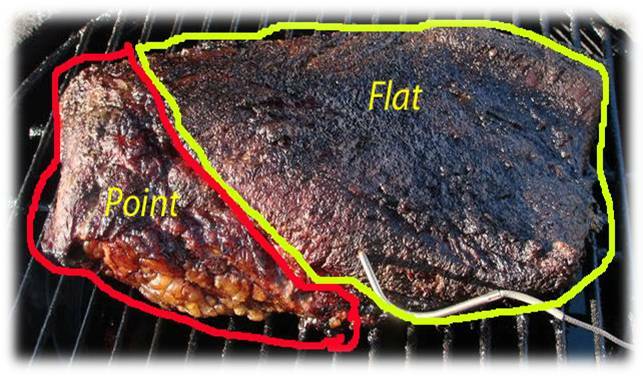 The images below will help to illustrate where the point is and how to properly cut a beef brisket. 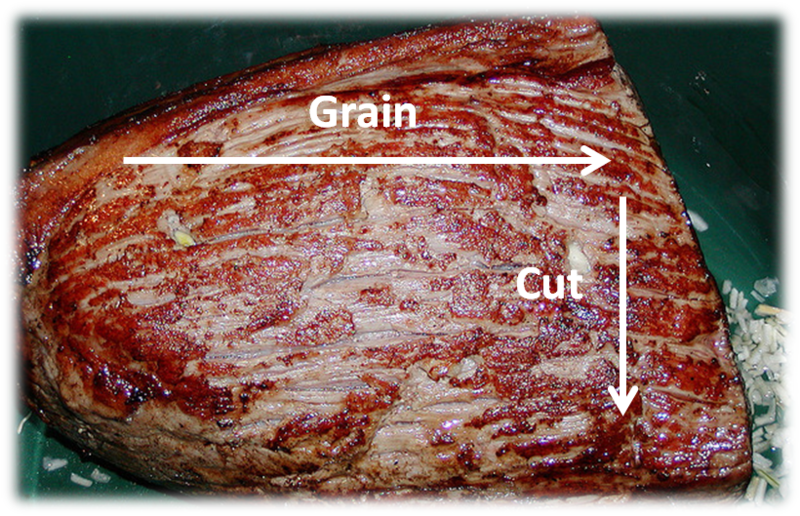 Make sure to cut against the grain or your beef will turn out tough. This recipe walks you through the full process of smoking the brisket, cutting off the point, and then smoking the flat by itself in order to make the burnt ends. Light your charcoal smoker approximately 30 to 35 minutes in advance of putting your brisket on. You will know that your charcoal is ready when all of the coals turn from black to a glowing white ash color. Cut small slits about an inch apart in the white fat on the top of the brisket to allow the rub to penetrate the inside of the meat. This is called "scoring" the brisket. The white fat part of the brisket will go face up on the smoker to allow it to melt down into the meat as opposed to just melting under the grill grate and not helping to tenderize the meat. Next, rub your mustard all over the outside of the beef brisket. Make sure to fully coat the meat and inside some of the cracks that you cut during the scoring process. Then sprinkle your barbecue seasoning or rub all over the outside of the meat. Make sure the brisket is fully coated all the way around with seasoning. Baste the smoked beef brisket with the mop sauce ingredients consisting of beer, cider vinegar, and Worcestershire every hour starting two hours into the smoking process to help maintain moisture in the meat. You ideally want to use a BBQ mop that looks like an actual miniature mop and not a brush to apply the mop sauce. If you use a brush it will tend to wipe the seasoning off the top of the meat instead of gently applying the sauce on top of the seasoning. Brisket will take about an hour to an hour and 15 minutes per pound to cook on the smoker. You are looking for an internal temperature of about 185 degrees Fahrenheit before you can take it off the smoker. With certain smokers it may be hard to reach this internal temperature because your heat source is far away from the brisket. If this is the case, you can always wrap your brisket in aluminum foil or finish your brisket for the 45 minutes to an hour in the oven at 250 degrees. Next, cut the point off the brisket and cut the point, against the grain, into small squares that are about a 1/4 of an inch in size. Put your cubed brisket point into a foil pan and coat with your favorite BBQ sauce recipe. Throw the aluminum foil pan back on the smoker for another couple hours so the bits of brisket become charred or burnt on the ends. Let the burnt ends sit for 15 minutes before serving with some additional BBQ sauce.